Nurses in the country began protests last Wednesday while teachers are expected to go on strike from September 19. They are demanding an increase in pay of 6.5%. Nurses in Swaziland went on a strike on September 5, demanding a hike in salaries of 6.5% based on the cost of living adjustment (COLA). The nurses organized under the banner of the Swaziland Democratic Nurses’ Union. The strike was also in response to the lavish and wasteful expenditure of approximately E1 billion ($66 million) by king Mswati III on the occasion of his 50th birthday on April 19th. The wasteful spending by the government and the lack of investment in the health sector led to public hospitals running out of vital drugs and equipment. No financial assistance was provided by the government to procure medicines and essential equipment to make up for the shortage, with the government claiming that it was facing a cash crunch at that time. Instead, on September 7, the ministry of health filed an urgent court application seeking a restraining order on the strike by the nurses, the Communist Party of Swaziland said. The court, however, after hearing the nurses’ arguments, decided against granting the government any interim relief, postponing the decision on the matter to September 14. Meanwhile, the Swaziland National Association of Teachers (SNAT) also announced plans to organize a strike on September 19. The national executive committee of the SNAT informed its members that it had served a notice to the ministry of public service and the labor commissioner, informing them of the planned action. The conciliation, mediation, and arbitration commission (CMAC) has also been given a copy of the notice, in addition to being requested to conduct a ballot. 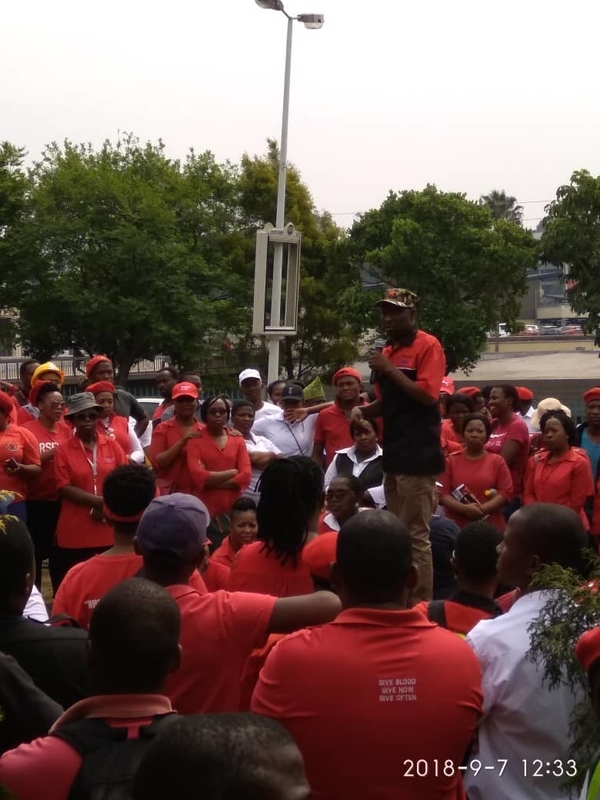 Njabulo Dlamini, the international organizer of the Communist Party of Swaziland, told Peoples Dispatch that the teachers, like other civil servants, were demanding a 6.5% salary increase on the basis of COLA. He also said that the salaries of civil servants were last raised in 2016. The number of people affected by this issue is nearly 40,000, including government employees from various departments and armed forces personnel. The unions have pointed out that the salary hike In 2017 on the basis of COLA should have been 7.85%. But the government failed to adjust the salaries of civil servants as per the COLA that year. In 2018, the government has not increased the salaries. On top of all this, the government increased the VAT (Value Added Tax) from 14% to 15%. Along with the rapidly rising fuel and electricity prices, the steadily increasing cost of living and the abysmally low salaries have started taking a toll on the civil servants. The joint negotiating forum has also been unhelpful in obtaining any favorable terms for the workers as it has been repeatedly misused by the government’s negotiating team. Dlamini also noted that while on the one hand, the government keeps citing the excuse of cash shortage for its inability to hike salaries and procure essential medical supplies, on the other hand, it is somehow able to fund excessive, elaborate functions and festivals, and provide for expenditure such as external trips by the royal family and its huge delegations, as well as a four-engine Airbus aircraft for use by the royal family. The consequences of this kind of reckless, lavish spending are being borne by the common people of Swaziland in the forms of insufficient drugs in hospitals, a shortage of teaching materials in schools and no scholarships for students, among others, he added.